Department of Homeland Security head Jeh Johnson informed Americans on Wednesday that the country is likely to suffer more domestic terror attacks, warning that the department cannot make all threats "a priority" and that the likelihood of an extremist "attack is still there," despite the department’s best efforts. Johnson, speaking at the Atlantic magazine ideas forum, admitted that DHS sees a range of threats on the homeland, but "can’t say everything is a priority." He was unable to provide any firm figure quantifying the number of attacks that could be faced in the upcoming months. The top homeland security official also lamented that the American press only covers "bad news" and that "the good news in homeland security is often no news." "You can’t say everything is a priority," Johnson said during a panel discussion with former DHS head Tom Ridge. "You’ve got threats that are high impact, but not necessarily high probability. Then you’ve got threats that are high probability, but likely, or perhaps, less impact, like a [homegrown violent extremist] attack, which could involve as many as 50, as many as 10" fatalities. 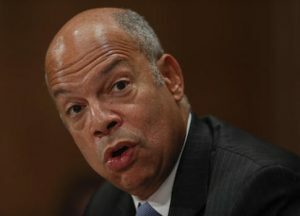 DHS does its best to assess the threat landscape, but "you have to prioritize," Johnson said. "You can’t say it’s all a priority." The likelihood that America will face more terror attacks from homegrown violent extremists, also known as HVEs, "is still there and we need to address it," Johnson said. Johnson’s remarks come on the heels of multiple deadly terror attacks across America that have been committed by Muslim extremists affiliated with the Islamic State and other terrorist organizations. The DHS leader said he has no good way to determine how many terror attacks could be coming down the pike. The threat of a mass shooting, dirty bomb attack, biological attack, terrorism in the air, or even the poisoning of America’s food supply are all real threats—and not all can be given top priority by the agency. "If you’re asking how many San Bernardino or Orlando type attacks will we have in the year 2017, no national security, homeland security, or law enforcement expert is in a position to quantify it," he said. "We haven’t ended the scourge, the threat of homegrown violent extremists." "People ask me, ‘What keeps you up at night?’ That is thing number one, the prospect of another home-born violent extremist acquiring a weapon or tool of mass violence and carrying out an attack somewhere here in the homeland," Johnson said. "It cannot be quantified. It is difficult to detect given the nature of it." Johnson said that Americans should take solace in "all the things we’re doing, the 10 or 12 things we’re doing" to keep the populace safe on a daily basis. "You cannot eliminate all risk, whether it’s a terrorist attack, or mass shooting, or gang violence," he said. Johnson also cited the media for its coverage of only "bad news" stories that gives DHS a bad rap. "If there’s a successful national political convention from a political standpoint," or other high profile event, "it’s the result of a lot of hard work and dedication," Johnson said. "That doesn’t always get reported. Bad news is front page news, but the good news in homeland security is often no news." He went on to cite "cyber security" as "priority number one" as rogue nations such as Russia, Iran, and China step up efforts to penetrate secure U.S. government networks.